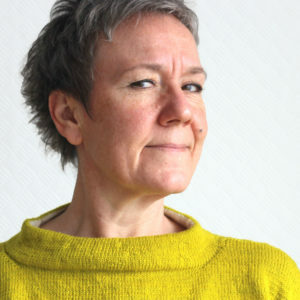 Let’s meet for some Ziggurat knitting fun with Åsa Tricosa! We will gather in a picturesque former train station, Bahnhof Hohenstein, which has been transformed into a luxurious retreat space. Expect four relaxed days full of knitting, delicious food and good company! *Please note that this is an English speaking event. Bitte beachtet, dass die Veranstaltung in englischer Sprache gehalten wird. 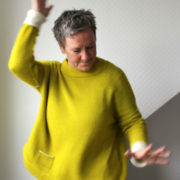 Åsa Söderman (of Åsa Tricosa) is a Swedish designer who now lives in Germany with her Danish husband, where she knits, reads, and bakes with abandon. Åsa designs things she likes to wear, things that are missing in her closet, things begging to be invented. Her style is simple with great attention to the telling or funky detail and sometimes a slightly mad construction. She likes to think of her work as well crafted in the Scandinavian design tradition. The seamless top-down Ziggurat method is her signature technique. It has evolved over several years, and it keeps evolving. For that is what is so exciting about knitting. There’s always something new to discover or invent and make. You can find her designs on asatricosa.com and on Ravelry. 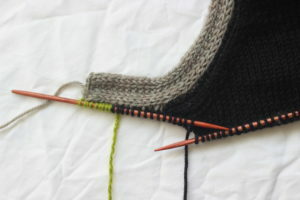 This is a workshop filled with inspirational knitting techniques and the chance to create your own custom-fit Ziggurat sweater. You will be able to knit and learn at your own pace and have many opportunities for one-on-one learning and tuition – in the good company of fellow knitters. Knitters will be carefully guided through the mysteries of gauge and stitch counts to personalize a pattern for sweater that really fits (that is Åsa will happily figure it out for you). Over the following days participants will progress, at their own speed, to cover the following a multitude of techniques, such as: magic loop knitting; provisional cast on; short rows; attached i-cord; top-down beginning of hat/mitten/toe-up socks, cable patterns; double-knitted pockets, other pockets, and more. In fact, the days will be packed with inspirational knitting “secrets”; and while you may not complete a sweater, you will be well on your way, with follow-up notes and continuing online help from Åsa. There will be sessions on lined seamless hems, winding provisional cast ons, 3-needle and stretchy bind offs, magic looping, pocket variations, hem variations, the perfect (it is!) button band, double cuffs, interesting ribbing and other stitch patterns, and… more! Over our four days together we will pick and choose which techniques and tricks to spend more or less time on, and there will also be opportunities for one-on-one mini sessions throughout our knitting days together. And we will have fun! We will welcome you in Hohenstein on Thursday, 10th May from 3 p.m. with a piece of homemade cake and a cup of tea. We will all gather around our big workshop table at around 4 p.m. for an opening session of measuring, planning and emergency swatching until we head over to the restaurant for dinner. 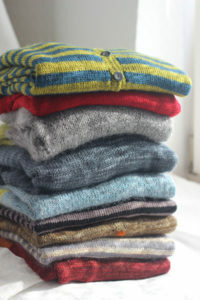 Each of the following days will be filled with lots of knitting in a morning and an afternoon session with Åsa. Between workshop sessions and meals in the restaurant there will be ample time for walks and relaxed knitting. The afternoon session on Sunday will finish with a show & tell at 4 p.m. We will be leaving Hohenstein by 5 p.m. on Sunday…with a sweater well underway and plenty new knitting skills to take home. The Ziggurat Knitting Retreat will take place at the Bahnhof Hohenstein, a picturesque former train station which has been transformed into a luxurious 5-star retreat space. Bahnhof Hohenstein is situated in Taunus, a beautiful region close to Wiesbaden and Frankfurt. Accommodation will be at the Bahnhof Hohenstein and the nearby Landgasthof Wiesenmühle (where we will also have our meals, a very short walk of 2-3 minutes from the Bahnhof Hohenstein). Rooms in the main house of the Bahnhof Hohenstein are double rooms with twin beds. These rooms may be booked as double rooms or as single rooms (with additional costs). For all double rooms you may either register individually (and we match you up with another attendant) or book together with a friend. Bathrooms are shared. The garden house at the Bahnhof Hohenstein is a small separate house with a double room with two twin beds, bathroom and kitchenette. Rooms at the nearby Landgasthof Wiesenmühle are single rooms (or double rooms used as single rooms). The workshops with Åsa will take place in the former waiting hall of the train station, now an inviting workshop space. In addition, we’ll have a living room and a dining room for cozy knitting and chatting throughout the day and in the evening. Weather permitting we may venture outside and enjoy the beautiful location in the country side to sit and knit. You are also welcome to use the sauna. We will have breakfast, a light lunch and dinner in the close-by restaurant Landgasthof Wiesenmühle (a 5-minute walk from the Bahnhof Hohenstein). Meals are included in the registration fee, drinks to accompany meals are paid individually. There will be homemade cake in the afternoons and coffee and different sorts of tea will be available for free throughout the retreat. Bahnhof Hohenstein is situated in Taunus, a beautiful region in Germany close to Wiesbaden and Frankfurt, making it very accessible from Frankfurt Airport and train stations in Wiesbaden and Frankfurt. For those who will be arriving by plane or train, there will be a free transfer from Wiesbaden main station to Hohenstein leaving Wiesbaden at 2.30 p.m. For your way home there will be a transfer from Hohenstein to Wiesbaden on Sunday at 4.30 p.m. Please book this transfer with your workshop registration, there will be an additional fee for later booking of the transfer. For those arriving by car, the address is Bahnhof Hohenstein, Am Bahnhof 4, 65329 Hohenstein.